John Wall led the way for the Wizards with 18 points and eight assists as the Wizards beat a depleted but feisty Knicks team 101-91. The loss is the Knicks’ 13th straight, their worst losing streak in franchise history. 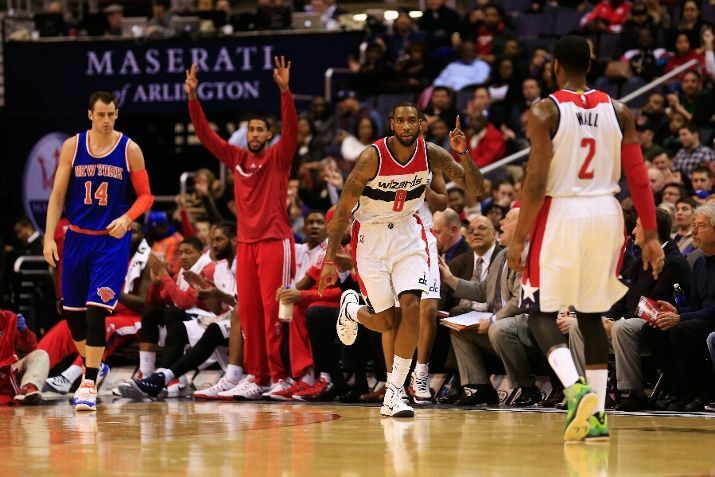 The Wizards pulled out to an early lead hitting three of their first four shots from the field. Nene was active from the beginning and his jump shots were falling tonight; always a good sign. The Big Brazilian finished with 20 points on a very effective 8-13 shooting from the field. Otto Porter, getting his second start of the season for Paul Pierce, was very active especially off the ball. Otto had a nice baseline cut to convert on an easy layup as well as a nice hook shot next time down the floor. Otto continues to stay active and is growing more and more as the season goes on. The reserves came out sloppy in the 2nd quarter, carelessly turning the ball over on their first three possessions. It was nice to see Martell Webster come in and get some playing time after his back surgery. Martell hit his first shot off the bench which was a three pointer, fittingly. The Wizards who are the best three point shooting team in the NBA, did not shoot the three ball particularly well in the first half. Beal started 0-5 including 0-2 from long distance as the Wizards only hit two threes on eight attempts in the first half. Back to back steals and easy lay ins from the speedy John Wall helped the Wizards stretch the lead to 12 at intermission. Beal found his shot in the quarter banging home his first three, three point attempts. After the game he admitted that he was lazy with his shot and put more of an emphasis on getting his legs underneath him in the second half. The Wizards were up by 20 points at one point in the 3rd quarter but the Knicks used a 15-5 run to end the quarter and cut the lead to 10 entering the 4th. The Wiz couldn’t buy a bucket to start the 4th quarter and you could feel the Wiz faithful getting a bit antsy. The Knicks rallied to cut the lead to 5 at the 7 minute mark. Rasual Butler came up big with a nice jump shot and a steal and lay in on back to back plays to stretch the lead to 9. The Wizards never looked back and closed the Knicks out 101-91. Huge test coming up with back to back games against the Bulls and Hawks. See you Friday.